My copy: From Netgalley, and from a Bloomsbury ANZ giveaway, thanks! Celaena Sardothien, or Adarlan’s Assassin as she’s infamously known, is offered a deal – take part in a competition against other thieves and brutes for the position of King’s Champion. If she wins, she’ll be granted her freedom from the Salt Mines where she has been enslaved for the past year. Chaol Westfall, the Captain of the Guard, takes her for training on behalf of her sponsor, the Crown Prince Dorian. As the competition begins to heat up, one by one, the champions are discovered horribly murdered by a vicious beast in the deserted corridors of the castle. Where to begin? I loved reading this book. I didn’t want it to end – I was completely caught up in the story and hated having to put the book down! It was partially the romantic aspects of the story that were keeping me reading, but also the exuberance with which Celaena jumps into any challenge coming in her direction – and the the challenges do come, thick and fast. 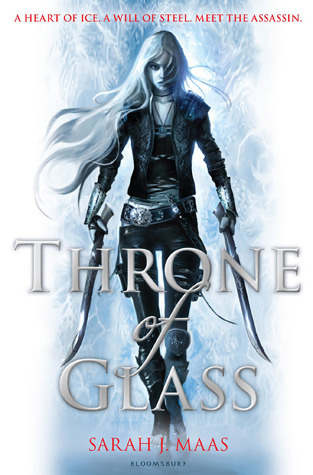 Throne of Glass is certainly not the “Game of Thrones for YA readers” that I had heard about – it’s a light and enjoyable read, despite its 400-odd pages. Early on while the competition was getting under way, it seemed almost like a fantasy Big-Brother-style elimination with one competitor leaving after each test, but the story didn’t deal very much at all with the actual competition. The relationships between the competitors, the strange magic symbols appearing around the castle, the mysterious murders of the champions and the court intrigue with the King, Duke Perrington and the Lady Kaltain provided most of the suspense. The story is supposedly based on Cinderella, but apart from the part when they all go to the ball, I must admit I don’t see any similarities. If anyone can enlighten me here, please do! Celaena is completely adorable. At first she comes across as quite arrogant and selfish (actually that feeling never really goes away), but as the story progresses she shows much more of her vulnerable, girlish side hidden under the prickly exterior. As with so many young adult books, there is a love triangle of sorts. In this case, it was quite delicious and I enjoyed the swoony romantic scenes, even if they were a little shallow and eyeroll-worthy at times. I know this is aimed at a younger audience and all, but I didn’t feel the story would have been hurt by perhaps Celaena actually spending a night with the Prince. They are adults, after all! What is it with all these lovely honourable men in books these days? Throne of Glass is a brilliant debut and I am dying to read the next in the series already to find out where Celaena’s adventures take her next! Get your copy as soon as you can. There’s a handsome prince. And puppies. Did I mention the kick-arse heroine? Warnings: Quite a bit of violence. 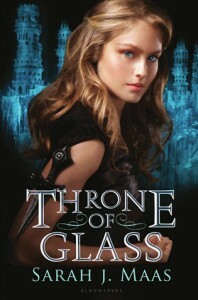 What did others think of Throne of Glass? I have seen this book around on several sites, apparently a real hot item at the time (When’s the movie coming out?). I love the cover, but haven’t yet added it to my TBR. I’m waiting for someone to convince me, and that hasn’t happened yet. As a 63-year old man who went to war as a teenager, I have a fundamental “suspension” problem with an 18-year old master of anything, except maybe the art of looking cute. I could take her as a gifted apprentice, an intuitive assistant, or something similar. Child prodigies do exist; Mozart could hear the music, but he still had to learn the piano, and how to write sheet music, and all the rest. I could see this girl having catlike reflexes and phenominal balance, and in the process of being developed into a master by a past master whose skills have faded, but not a master herself, not yet. In fairness, it’s been a long time since I was a young adult, and maybe an accomplished hero their own age is what’s required here. What I remember from that age is reading about adults, from James Bond to Sherlock Holmes, and saying, “That will be me someday.” An excellent review, but I’m still likely to pass on this. Thanks for taking the time, and keep up the fine work! This book seems popular among Australian book bloggers. It’s not just the Aussies! So glad to hear that you loved this one! I really enjoyed reading it too, though I didn’t know that it was supposed to be based on Cinderella. I agree, though, that apart from the ball and the fact that the prince fell in love with her, these two stories were NOTHING alike each other.